When I first wrote my list of 100 books I wanted to read in 2015, I included a few books I'd been wanting to read for months. One of those books was Kate Atkinson's Life After Life. I'd repeatedly carried Life After Life around book stores, put it in my Amazon shopping cart, and read reviews. I'd thought about reading it a lot, but something always stopped me. To be completely honest, I think I was put off by the cover: there is something overly sappy about it, as if it will be a bad romance novel. I'm not a huge fan of novels that are epic, sweeping romance dramas. I just find them a bit boring. I want more from my novels. This past weekend, I found myself looking at a few blissful hours of alone time. Danny was sick and had homework to do; I'd cleaned the house, done the laundry, washed the bedding. With so many hours, I didn't want to just sit and watch TV. I spent a way-too-stressful hour looking at my book list and reading reviews on Amazon. Twice, I settled on Life After Life and changed my mind. Finally, I bit the bullet and bought the book, sending it to my Kindle. I had read reviews, sure, but I wasn't 100% aware of the big plot point until I started reading the book. I'll get to that in a second though. 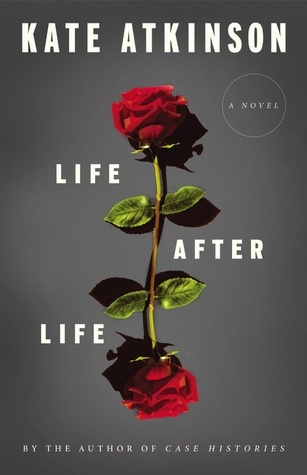 I read Life After Life in two days. That in itself is not an endorsement: I can read most books in two days, one day if I really dedicate myself to it. However, I found myself talking about Life After Life constantly. The first thing I said to Danny about the book was: "I wish I'd thought of it." What did I say after I read Tony Doerr's All the Light We Cannot See? "I wish I'd thought of that title, it is killer. Also I wish I could steal his ability to use similes." My ringing endorsement is usually the sentiment of "I wish I'd written this; I'm mad that I didn't." Life After Life is built around the premise that Ursula Todd is stuck in a time loop: every time she dies, she starts over again. Sometimes, things are different from the very start; in most versions, her mother gives birth alone, her father searching France for her runaway aunt, Izzie. In one version, her father makes it back in time and they raise Izzie's son, Roland, as their own. In a few versions, Ursula dies at birth, or is born dead, or is suffocated by a cat named Queenie (an old wives' tale come to life). Either way, Ursula gets a lot of chances, but the reader is unsure if Ursula is ever 100% aware of her past experiences. There are a few events that suggest Ursula is able to tell change what happened. In one version of her life, Ursula drowns as a child while on vacation; the next go around, she becomes terrified to go near the water and her sister pulls her along anyway. She is saved by a man sitting on the beach painting. In another version, Ursula's horrible brother, Maurice, throughs her doll out the window; she dies falling off the roof trying to retrieve it. The next time around, her sister, Pamela, uses a stick to pull the doll inside. In these small instances, Ursula was filled with dread when approaching the situation: the doll on the ledge, the water's edge. She doesn't really remember, but she knows something is about to happen. As she gets older, if she does get older in that life, she identifies feelings of extreme deja vu, as if she's lived everything before (which, if you buy that she really is living life after life, she has). There are other instances where you wonder how aware Ursula is of her past lives. In one life, she is assaulted by one of her brother's friends, Howie; she gets pregnant, has an illegal abortion, and almost dies. The black sheep of the family, she ends up marrying an abusive man and is ultimately beaten to death. In her next life, she doesn't seem aware of Howie's future behavior, but at their first meeting, she promptly punches him in the face. In some versions of history, her next door neighbor, Nancy, is murdered while out looking for leaves for a scrapbook; Ursula usually takes another route home, or a detour, in order to intercept Nancy and save her. We don't know how much she knows she's doing this. She just... does it. However, in one version, Ursula is distracted by her crush and Nancy is murdered. Chance didn't work out in that version, I guess. The most interesting part of the story is this: Ursula never marries in any of her lives, except two. In one, she marries the man who ultimately beats her to death. In the other, she goes to Germany on a world tour and ends up staying in Germany, marrying a man, and having her daughter, Frieda. In other versions of her life, she never has children. But when she has Frieda, she ends up having to kill her daughter and herself and start over again; she never stays in Germany again, never meets her husband again. It is almost as if Ursula purposefully chooses to never have a child, because she knows in that version of history, her child always dies. It might sound boring to read the same life over and over again -- and there are definitely parts where it becomes a little too hint-hint, nudge-nudge -- but it is also incredibly engrossing. Ursula's panic and confusion over her moments of deja vu, her sense of knowing what will happen before it actually does, her grappling with reality is intense. Beyond that, the book paints the idea that sometimes the most important connections in life aren't romantic: Ursula's love stories are few and far between. Instead, the relationship between siblings is examined and poked: the things we do to save our siblings, to make them happy, to keep them from pain. In several versions of history, the Todd family maid, Bridget, attend Armistice Day celebrations in London and brings the Spanish Flu back to the Todd home, killing Ursula; in another version, Ursula manages to stay away from Bridget, only for her little brother, Edward, to get sick and die. Over and over again, Ursula struggles to find a way to not just save herself, but to save her siblings; and, it is interesting to note, she is never once concerned with saving Bridget's life. Her ultimate solution is to push Bridget down the stairs, breaking her arm, and, in later versions, to tell Bridget that she'd seen her boyfriend cheating on her. Both work to save the family. It makes me wonder what moments would stand out in my life if I were to live it over and over again. What things would I change? What would I do differently? The best kind of novel is one that makes you think deeply about your life and your choices -- and Life After Life does just that. Older PostWhen (and Why) Did I Start Expecting Bad Customer Service?